A new study shows that in men having prostate cancer, a large prostate due to BHP actually impedes tumour growth. The study has been published in the Proceedings of the National Academy of Sciences. Benign prostatic hyperplasia (BHP) commonly known as prostate enlargement is a condition where the prostate glands in males grow bigger than its actual size. Almost all men have to suffer from this condition once in their life, in older age. 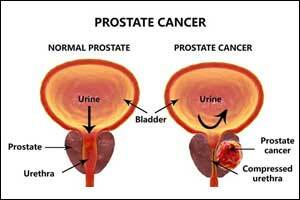 In fact, it is so common that it is said all men will have an enlarged prostate if they live long enough. It is estimated that it is present in more than 90% of men over age 80. BPH is often confused with the advent of prostate cancer as the symptoms of both the conditions are quite similar like difficulty in passing urine, urge to empty the bladder than normal times, the weaker flow of urine etc. BHP does not usually develop into cancer but it may contain certain areas of cancer cells. However, having an enlarged prostate might be good news for them who have a combination of both BHP and prostate cancer. A new study has come out to demonstrate how BHP may help in reducing the spread of prostate cancer. The study is the first to simulate the possible effects of benign prostatic hyperplasia, a disease that causes the prostate to enlarge progressively, on the tumours of prostate cancer. “It’s already known that forces and stresses have an impact on tumor growth and that patients with enlarged prostates tend to have slower cancer growth, but it wasn’t known why,” said Hector Gomez, associate professor of mechanical engineering at Purdue University, who builds models and simulations for understanding tumor growth, cellular migration and blood flow. Computer simulations of patient data offer a possible explanation of why an enlarged prostate might be a lifesaver: because a prostate can only grow so much within a confined space, force accumulates and puts pressure on the tumor, effectively keeping it small. The study looked at data from patients in medical studies who had a history of both an enlarged prostate and prostate cancer. To perform the simulations, Lorenzo extracted three-dimensional anatomy of the prostate and locations of the tumors from MRI images. The findings suggest that it might be a bad idea to downsize an enlarged prostate through surgery or drugs because doing so could lead to faster growth of prostate cancer. While the five-year survival rate for prostate cancer is generally very high, it is still one of the leading causes of death among men in the U.S., according to the Prostate Cancer Foundation. At the end of a one-year period, the simulations showed that the tumor of a patient with a history of an enlarged prostate barely grew at all. When the researchers removed the history of an enlarged prostate in the program, the tumor had grown to be over six times larger at the end of the same time period. “But now we know that the mechanical stresses that originate as prostates enlarge impede tumor growth,” Hughes said.